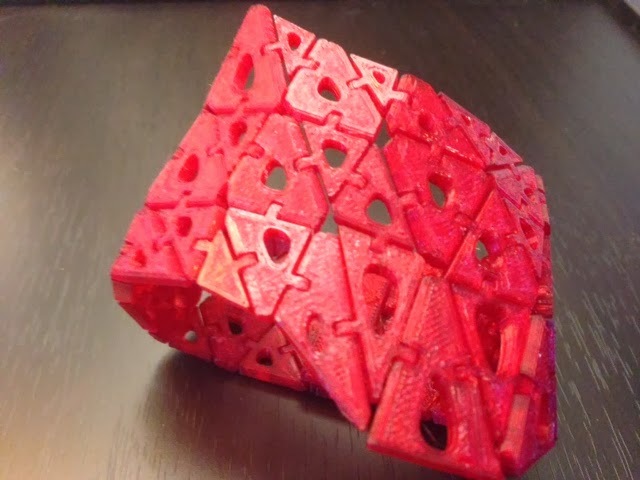 Yesterday's bracelet was so great that we decided to print another one today, again from Nervous System's Kinematics@home site. Technical notes: The clasp in this bracelet design needs work; it's a bit clunky and results in a double-layer section of the bracelet. I'm hoping that this is something they will fix in the future. Stuff you might want to change: Tinkercad has trouble opening the .stl file from Kinematics. However I bet that some remeshing in Meshlab could get the .stl file into a form that Tinkercad could understand, and then the hinge could be improved directly in Tinkercad however you like.